Sasaki Time: Vehicle Review: 2015 Hyundai Genesis - The Luxury Car for Everyone! 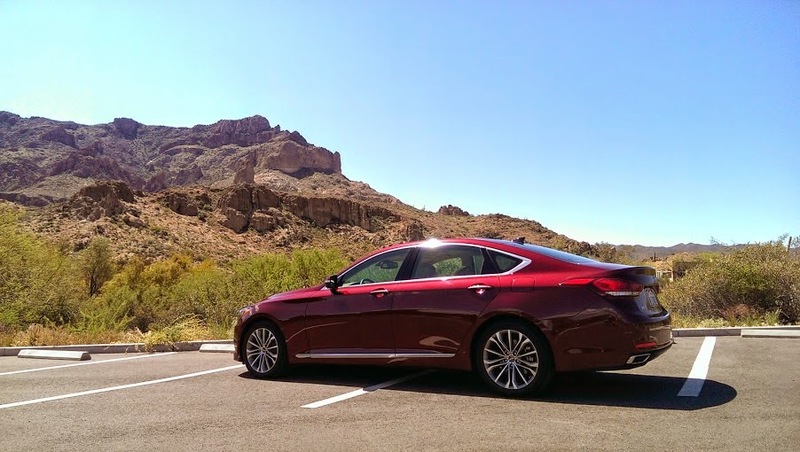 Vehicle Review: 2015 Hyundai Genesis - The Luxury Car for Everyone! 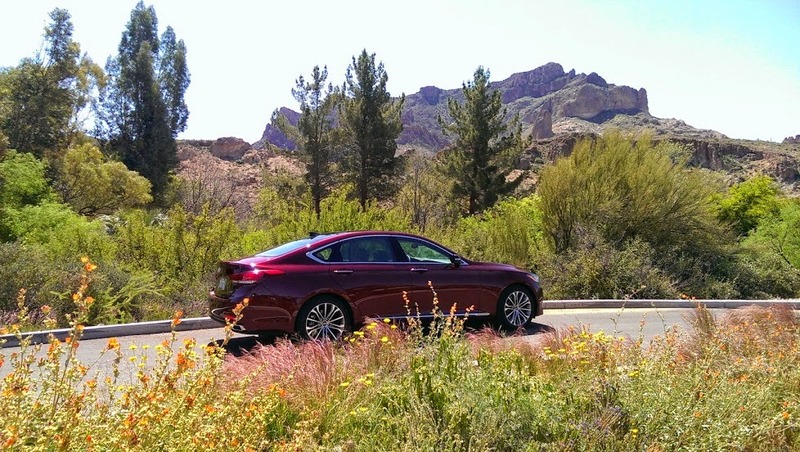 I was recently invited to Scottsdale, Arizona for the media introduction of the 2015 Hyundai Genesis. The Genesis had been introduced way back in 2008 and now this is the second generation Genesis. It is bigger, sleeker and packed with enough technology and safety features to take on the recognized German sedans but at a significantly lower price. The Genesis is beautiful from any angle that you look at it. Its design is one of the best to come from Hyundai's Fluidic Sculpture Philosophy. If any vehicle looks like it is still moving, while it is sitting perfectly still, then it is the Hyundai Genesis. The smooth lines of the Genesis emulate the arch of this bridge that we came across on our drive. Even the name Genesis is of significance to Hyundai. The winged emblem is exclusive to the sedan and the Hyundai logo is only on the rear of the vehicle. Even the lights create a luxury feel. The small LEDs that surround the headlights remind me of small gems. Even the fog lights are composed of all LEDs. Stepping inside the driver's seat and you are surrounded in luxury. From the plush leather seats, heated and ventilated front seats, actual wood grain trim, a Lexicon 14-speaker audio system (the Tech Package upgrades that to a 7.1-channel Lexicon audio system with 17-speakers), rain-sensing windshield wipers, an automatic defogging windshield, and a power rear sunshade. The Premium with Navigation Package adds a 7-inch touchscreen navigation system. The Tech Package offers the premium 8-inch non-touchscreen navigation system and XM NavTraffic system. The Genesis also provides some of the most leg room in any vehicle I have experienced thus far. You have the option of adding rear heated seats if you so desire. Taking a look at the arch of the bridge through the panoramic sunroof. I found myself looking up quite a bit when it was my turn to be the passenger and take in the views. It was so cool to see the world pass on by through this view. I can only imagine what it would be like to take in a clear night sky to see the moon and stars or in a rainstorm and watch the rain come down. One of the coolest features is the Smart Trunk System. While leg sensors are nothing new, the Genesis takes this technology to the next level. Instead of the sensor picking up your leg movement under the trunk, the Genesis picks up your smart key if you are within three feet of the trunk for longer than three seconds. What a great feature if you have a child in one arm and bags in the other. The trunk is also super spacious and you will have no problem storing groceries, luggage or a couple of golf bags. The 2015 Hyundai Genesis offers a base engine that is a 3.8 liter GDI V6 that delivers 311 horsepower (estimated 22 mpg). The 5.0 liter V8 option delivers 420 horsepower (estimated 18 mpg). The new all-wheel-drive system called HTRAC is available as an option. While I do not use cruise control in Orange County due to the traffic congestion, the Smart Cruise Control is a really cool feature. It actually adjusts your speed based on the vehicle in front of you. The system is smart enough to stop for you and then start again. This system senses where the vehicle in front of you is and slows down or stops your vehicle as necessary. This works perfectly with the rear view camera. You get both an audible as well as a visual warning if anything is detected in your rear-cross path. This is probably the most interesting safety feature I have seen. This is the worlds-first use of this type of technology to help with the alertness of the driver. The technology detects the amount of carbon dioxide in the cabin and regulates it with outside air if necessary to keep the driver from falling asleep. One of my favorite features and happy to see more vehicles adding this. 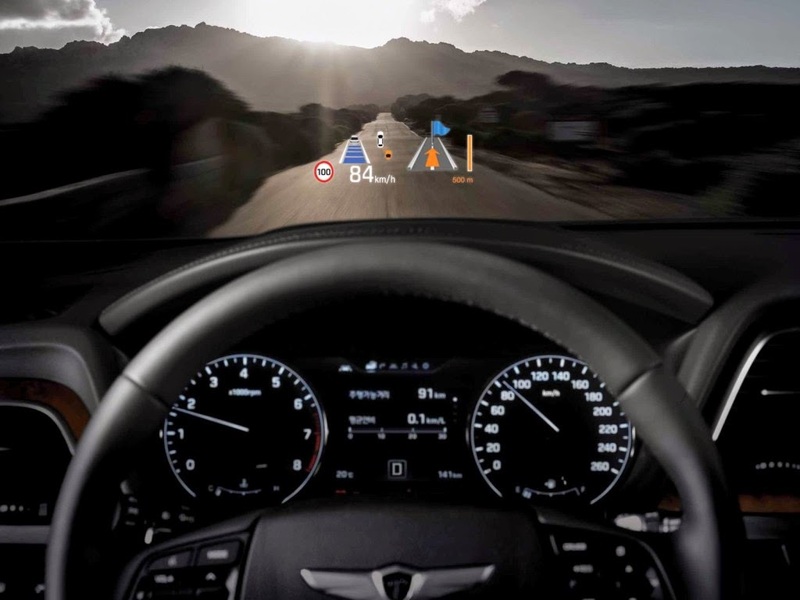 You get a warning on your side mirror and on the Head-Up display to let you know that something is in your blind spot. If you decide to ignore the warning and turn anyways, the steering wheel actual vibrates to further warn you. By far the coolest thing I have ever seen on a vehicle. As much as I love the other safety features, this is the one that makes me feel like a fighter jet pilot. All of your critical information is right in front of you so you do not need to take your eyes off the road. You can see what the current speed limit is, your current speed, any safety warnings if there are any, and your navigation plan if you programmed a destination. With the redesigned 2015 Genesis, Hyundai is changing the way people look at their products. Once known only as the affordable choice, Hyundai is on par with all of the Japanese brands in terms of engineering, technology and performance. Now with the Genesis, Hyundai is ready to take on the German brands as well and offer a much lower price point. The Genesis offers a perfect balance between comfort, performance and amazing safety features. We will be seeing a lot more of these vehicles on the road over the next several years. The 2015 Hyundai Genesis starts at $38,000. Excellent review. Question: How did the panoramic sunroof work? Did the whole glass roof open? Tell me more please at wootz5@yahoo.com Thanks!